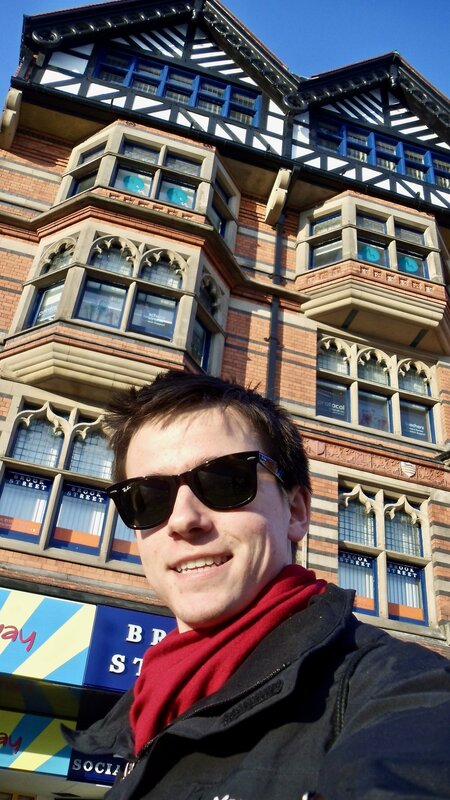 I went to the Nottingham City Center (downtown) the yesterday. It is only a short bus ride away. The trip is one pound with a student id. The city center is full of old buildings and winding streets. Many of the streets are for pedestrians only. I love old buildings so this was really cool. I didn’t enter any, just walked about. There are many stores and restaurants there, can’t wait to try them! The best way to get around is by walking. Everything is so close you really don’t need a car or taxi to take you anywhere once you’re in the city center. I still need a phone and some food for my dorm room, to snack on. There are grocery stores and phone stores all over the place there. The pound store looks really helpful. They have food, soap, tooth paste, sweeties (candy), office supplies all for a pound. I like the old feel of the city center and walking everywhere is cool. At home I need a car to get anywhere and most things are spread out (except the mall). However, I do not like being dependent on the bus service to get me somewhere on time.